Well, it’s Halloween. In the off chance you’re not completely put off by everything chocolate by the end of the night, why not warm up with a mug of hot cocoa to mark the end of another ghoulish evening full of kids dressed as princesses, Dora, and, um, The Situation. 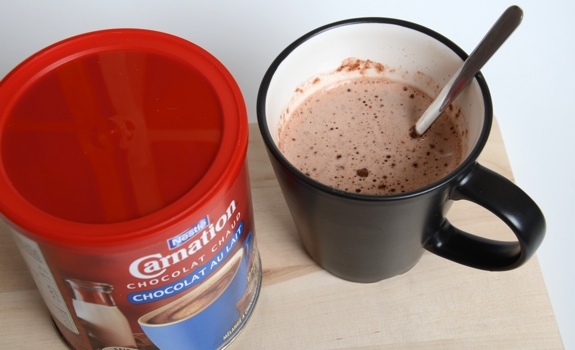 Carnation hot chocolate is the stuff I grew up on. 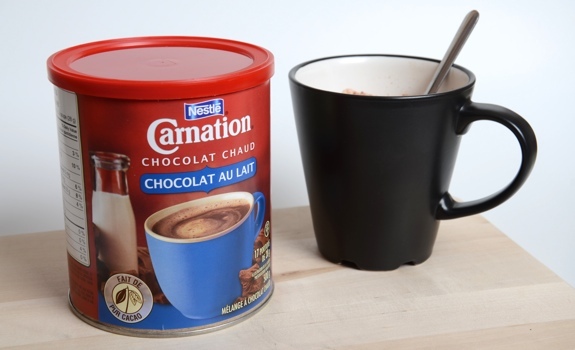 From good (spiked with extra hot chocolate powder to make a drink so strong it was like drinking chocolaty motor oil), to bad (after a night of church-sponsored tobogganing, so weak it was basically just scaldingly hot brown-tinted puddle water), it haunts my memories. While I’ve now graduated to fancier, more high-brow hot chocolates (“drinking chocolate,” if you will), I thought I’d revisit this classic, in the milk chocolate flavour. I made it two ways, just to compare. The Pitch: “A warm hug on a cold day.” Simple, basic and to the point. No pretentious marketing bafflegab about being sourced from the ancient cocoa fields of Xhawhaxacuaxhagua. The Look: Classic. The tin looks a bit more modern than I remember it, but it still has a warm, old-school vibe to it. The Taste (made with water): Not a bad water-to-mix ratio, though I’d probably add an extra tablespoon to make it richer. Even made without milk, it has a nice milky flavour. A very basic hot chocolate. Childhood flashbacks. The Taste (made with 2% milk): Waaaaaay better. It has a milk chocolate flavour and richness that the water-based drink lacks. Much closer to the kind of hot chocolate you’d find at a place like Tim Hortons. Cost: $6.49 for a 500-gram tin at Calgary Co-op. Value for cash money: Good. Way cheaper than chocolate-shop offerings, though not nearly as rich and chocolaty. A 500-gram tin is supposed to yield 17 servings. Nutrition? : Depends on how you make it. In powdered form, per 28 grams (3 tablespoons): 120 calories, 2 grams of fat, 140 mg of sodium, 1 gram of fibre, 1 gram of protein. The verdict: Water-based? A wave of nostalgia. Milk-based? Much better than I remember it being. If you have milk in the fridge, make it with that. Totally worth it.